Class to represent the fluid dynamics system. This class is used to represent a fluid system and take care of the time integration of the fluid dynamics. This is a class designed for base SPH simulation. The class holds pointer to data, which is hold somewhere else. It also include a forceSystem, which takes care of the computation of force between markers. The forceSystem is owned by the class. Class destructor. Deletes the force system. force system object. It calculates the force between markers. pointer to parameters. The values are mainained externally. 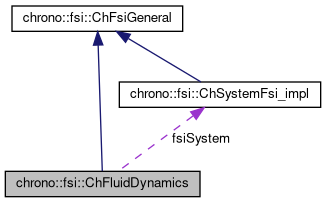 The class constructor performs the following operations: Instantiate ChFsiForce, i.e. force system; Copy the pointer to fluid data, parameters, and number of objects to member variables. Apply boundary to SPH markers (fluid and BCE). The function applies periodic boundary to the markers. It calculates the densities directly, not based on the derivative of the density. This function is used in addition to the density update in UpdateFluid. Synchronize the copy of the data (parameters and number of objects) between device (GPU) and host (CPU). Integrate the fluid system in time. The underlying SPH method implementation goes inside this function. In a explicit scheme, to perform the integration, the force system calculates the forces between the particles. Then the forces are used to to update the markers position, velocity, and density in time, the latter is used to update the pressure from an equation of state. In the implicit scheme, the pressures are updated instead of density. In an explicit formulation, the update Fluid function relies on explicit Euler Integration argorithm.